Where are we to make disciples? Here’s the simple answer. Wherever the church is, disciples are to be made. But I’m using the word “church” here in a biblical sense—not in a modern sense. The church doesn’t refer to a building. The church refers to God’s people. So, when God’s people gather on Sunday mornings, we ought to be about disciple making. When God’s people gather in a mid-week home growth group, we ought to be about disciple making. When God’s people share a meal with other, we ought to be about disciple making. When God’s people enjoy recreational activities together, we ought to be about disciple making. Wherever we find ourselves we should be about making disciples. Whether we’re at home, at work, at school, or just hanging out, we should be about making disciples. We should be helping other people to grow toward Christlikeness—moving towards Christlikeness. And at the same time we ought to be growing toward Christlikeness ourselves. But notice this as well. Disciple making doesn’t just happen in our immediate locale, wherever that may be. We’re to make disciples of all the peoples of the world as well. That means that we’re supposed to be strategic and intentional in our disciple making. It’s not enough to only make disciples in your home town or in your home state. It’s not enough to only make disciples in North America (or whatever continent you live on). 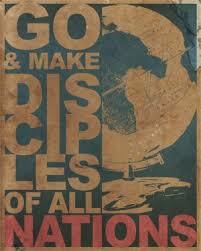 Jesus told us to make disciples of all nations. That word that’s translated “nation” in Matthew 28:19 is the word from which we get our English word “ethnic” or “ethnicity.” So, we’re to make disciples of every ethnic group all over the planet. Not just those who look like us and act like us. God is greatly glorified when people from diverse backgrounds gather and worship him. So, where are you going? Are you willing to go as far as the other side of the world to make disciples? Are you willing to go to the other side of the street to make disciples? Wherever we go—wherever God’s church is—disciple making should be taking place. This entry was posted in Discipleship, Evangelism. Bookmark the permalink.